Hi guys, I'm building an engine from a crashed 78 Darmah to swap into my SS while I build it's engine. Right now I've been working on the transmission repairing dogs and undercutting them. The gears are 6 dog - 3 short and 3 tall and I can see where there could be some slipping going on when 3 short dogs engage with 3 tall dogs. Mick Walker says the 3 dog transmission is an improvement, while Mr. Falloon says Ducati was fixing something that worked fine. From photo's I've found it looks like I could remove the 3 short dogs from gears and bing you have a 3 dog transmission. It will have more lash than a 6 dog. Your thoughts please? In the perfect factory where Guido could take his time to shim the gearbox perfectly, the six-dog would work perfectly for the rest of it's owners life. 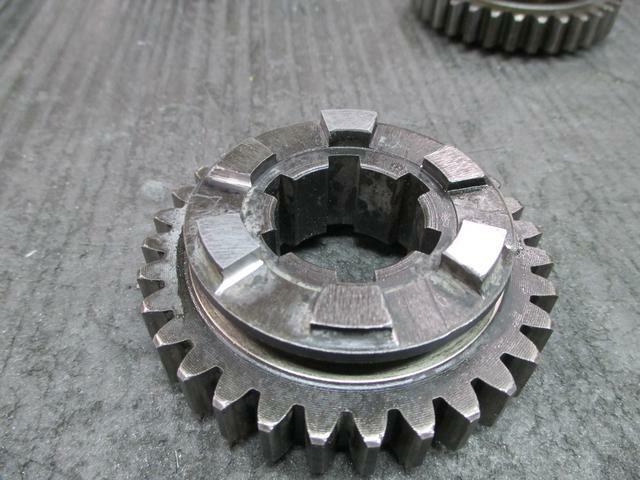 But when the three shafts' shimming is on the sloppy side, AND worst case scenario, the dogs get rounded and gears go popping out. It takes a few hours to get it right, but then it works perfectly. I regularly shifted clutchless during races (without any electronics) and the six-d worked fine (untill the next engine rebuild). Three dogs is a shifting improvement but create a bit more backlash. No problem when going on a nice road, but pia when You drive in traffic (from an engineers ears point of euh, view). I have to agree, I thought when I found a 3 dog cluster in my Darmah thought I had struck gold because I had heard it was a better "box than the 6, I does change very smoothly at speed better than a 6 but riding around town it is clunkie and difficult to ride smoothly. The change is put down to Steve Wynne so was intended to improve the box for racing.